Kenya National Blood Transfusion Service (KNBTS) mandate is to provide safe blood and blood products equitably through a strong, efficient, and self-sustaining national blood transfusion service able to respond to the needs of the entire country. KNBTS is committed to provide consistently high quality blood and blood products. To achieve this, KNBTS is implementing a quality management system with a view to achieving accreditation to international standards. Accreditation is an attestation that an institution has some verification of its quality and performance. ISO 15189 is the major standard for accreditation of blood transfusion institutions globally. Institutions accredited to ISO 15189 are formally recognized to be competent to provide reliable services. Implementation of ISO 15189 within KNBTS will result in significant improvements in the management systems and technical competence of its transfusion centres while the accreditation of its regional transfusion centres will improve services and ultimately the health of the patients receiving transfusion of blood and blood products in Kenya. Accreditation of blood transfusion services has remained a big challenge in resource constrained countries due to the high cost of attaining and maintaining accreditation. To address this challenge, the WHO step wise approach (Stepwise Laboratory Improvement Process Towards Accreditation (SLIPTA)) was developed and is being implemented as an effective structured approach for implementation of requirements of ISO 15189 with graduated recognition of laboratory quality improvement. The quantification of quality blood transfusion services enables progress to be measured and recognition of improvements motivates transfusion centers to continue on the stepwise ladder. All the 6 regional blood transfusion centers based in Eldoret, Embu, Kisumu, Mombasa, Nairobi and Nakuru are enrolled in the SLIPTA process as they endeavor to be accredited. The Strengthening Laboratory Management Towards Accreditation (SLMTA) program is a key tool in the SLIPTA process. This is training and mentoring program developed to achieve immediate, measurable improvement in laboratories in resource-limited. The SLMTA program supports laboratories by improving management and building preparedness for accreditation. The SLMTA program has unique features including use of a framework that defines management in terms of laboratory- specific job tasks performed by managers. It operates under the assumption that effective training is prescriptive, not just descriptive. The program is implemented in a series of multiple workshops delivered in a 6- to12-month period with intervening site visits. Between sessions, active learning continues with laboratory improvement projects and supportive site visits. Because behavioral changes take time, implementing multiple workshops allows the changes to be planned, monitored, and sustained. This model also allows facilitators to assess the effectiveness of training and address any observed misconceptions or gaps in the next workshop or site visit. Site visits provide the link between the classroom curriculum and the participant’s home laboratory. These visits affirm and reinforce continuous performance of good laboratory practices. A checklist is used to continuously evaluate the implementation of the program and to gauge the preparedness of the facility for accreditation. The SLMTA program therefore provides a comprehensive foundation to effect immediate behavioral changes and laboratory improvement. KNBTS staff and management have already been taken through the first workshop and are currently attending the second workshop. These are hands-on, activity-based workshops which allow learning by doing and job aids provided to facilitate performance of the taught tasks. In between the workshops, the centers undertook quality improvement projects and site visits were conducted to help the sites as they implemented the projects. It is anticipated that by the end of the program KNBTS will be ready for ISO 15189 accreditation and therefore move towards fulfillment of its mandate of provision of safe and sufficient blood in Kenya. RESPONSE BY THE KENYA NATIONAL BLOOD TRANSFUSION SERVICE ON THE ALLEGED SALE OF BLOOD AT NAKURU PROVINCIAL GENERAL HOSPITAL. 2ND OCTOBER 2015. The Kenya National Blood Transfusion Service (KNBTS) was established in the year 2001 as a Division in the Ministry of Health. The mandate of KNBTS is to collect, test, process and distribute blood and blood products to all transfusing hospitals in Kenya. The Division has six Regional Blood Transfusion Centres namely Nairobi, Embu, Nakuru, Eldoret, Kisumu and Mombasa and 14 satellite stations that are located in Machakos, Kisii, Voi, Meru, Naivasha, Kakamega, Kericho, Nyeri, Garissa, Malindi, kitale, Thika, Bungoma and Lodwar. The Daily Nation today carried a story alleging that blood is being sold at Nakuru Provincial General Hospital. While the Kenya National Blood Transfusion Service does not have control over the usage of blood after it is dispatched to the various transfusing hospitals we feel that we have a huge stake in this unfolding story. The alleged sale of blood is a very disturbing matter since it has the potential of stifling our activities since we rely 100% on voluntary, non-remunerated blood donors. If this continues the blood donors may turn their backs to us whenever we go out to mobilize them to donated blood. It is important for all health workers who in their course of duty handle blood in one way or another to realize that it is a precious commodity and it has no substitute, their conduct therefore has serious repercussions on the operations of the Kenya National Blood Service and indeed the entire blood sub – sector. To our faithful blood donors we want to re-assure them that as a government agency that is charged with the mandate of blood management we are going to step up our vigilance in collaboration with the hospitals and other partners to ensure we are accountable in the use of this precious gift of life. We urge the law enforcement officers to pursue the culprits in this matter and those found culpable to be prosecuted since sale of blood is illegal. On the current shortage of blood we are now seeking alternative strategies of mobilizing blood donors from Colleges, Universities and Uniformed Services since our main blood donors who are secondary school students are still out of school. We envisage that normalcy will resume once the Teachers Service Commission and teacher’s stalemate is settled. Our current blood reserves though minimal will keep us running until we can get enough. In the meantime we are moving blood units from areas where the supply is better to areas of shortage nationally. We however assure all Kenyans that there is no cause of alarm and no one will die on account of lack of blood. The Kenya National Blood Transfusion Service has initiated a nationwide blood donation campaign targeting the adult blood donors. The campaign that has been going on now for three months, it started in September this year in Nyeri County and will cover 11 counties in Kenya on a pilot basis and will later be rolled out in the remaining counties in the country. The campaign has been necessitated by the perennial shortage of blood and blood products especially in the months of April, August and December when schools and other institutions of learning go on recess. A research conducted by KNBTS recently indicated that adult blood donors are more reliable and responsive than those in institutions since they do not go on holiday and in most cases they usually have a permanent address. The Kenya National Blood Transfusion Service collected a total of 186,000 units of blood last year against a national requirement of 400,000 units. This under performance could be attributed to the poor blood donation culture among adult blood donors and in some instances gross lack of awareness among potential blood donors. Blood donation apathy among adult donors has resulted to low collections while the same adult donors are the highest recipient of blood. There is therefore great need to create a culture of voluntary blood donation through constant engagement with the adult donors through information, education and communication. In Kenya 2 of every 3 units of blood are transfused to mothers and children. It is unfortunate that Kenya has one of the highest maternal mortality rates worldwide at 488 maternal deaths per 100,000 live births, that translates to about 20 women dying every day from child birth related complications. The leading cause of maternal mortality is bleeding just before or after childbirth or due to a miscarriage, induced abortions and other pregnancy related complications such as tubal pregnancy. The demand for blood and blood product is on the rise owing to the sporadic terror attacks, road traffic injuries, cancer cases and anemia occasioned by Malaria and other medical conditions. This campaign therefore will attempt to mitigate the current scenario in an effort to offer Kenyans a more secure treatment and most importantly to save lives. It is envisaged that at the end of this campaign in the month of July 2015, the Kenya National blood transfusion service will have collected a total of 150,000 units of blood. The campaign is in Embu today, and will go to Mwea on Sunday 21st December 2014 and later on monthly basis to, Kiambu, Nyandarua, Uasinigishu, Kajiado, Laikipia and Nairobi. This will happen on every third Sunday of the month. The campaign is sponsored by Royal Media Services’ Inooro FM, Rotary club of Kenya among others. Following the terror attack at Mpeketoni Township last night where close to 48 people were allegedly killed , the Kenya National Blood Transfusion Service whose mandate is to collect, process and distribute blood and blood products to all transfusing hospitals in Kenya has this morning dispatched 100 units of blood to Mpeketoni Sub-County, Lamu County and Malindi Hospital. This is aimed at averting further mortality occasion by injuries that may require blood transfusion. The Mombasa Regional Blood Transfusion Centre is currently holding about 350 units of blood and we are ready to dispatch more when and if need arises. On average the normal blood consumption of Mpeketoni Sub-District is between 5 and 8 units per month. In the event of additional requirement KNBTS will mobilize blood donors across the country to donate blood to respond to the calamity. In the meantime we want to assure all Kenyans and particularly the injured and their families that no one will die on account of lack of blood for transfusion. DIRECTOR KENYA NATIONAL BLOOD TRANSFUSION SERVICE. The Kenya National Blood Transfusion Service (KNBTS) was established in the year 2000 as a unit in the Ministry of Health. Its mandate is to recruit Donors collect, process and distribute blood and blood products to all transfusing hospitals in Kenya. The Unit has six regional blood transfusion centres namely Nairobi, Embu, Nakuru, Eldoret, Kisumu and Mombasa and 11 satellite stations including Voi, Malindi, Kitale, Machakos, Meru, Nyeri, Kisii, Garissa, Kakamega, Kericho, and Naivasha. Blood collection in Kenya has faced low and high moments over the years as it depends on the availability of donors, who in our case the majority are students in schools and colleges. Over reliance on schools and colleges has therefore brought about perennial shortage of blood especially when these institutions go on recess in the months of April, August and December. In the month of March 2012 we managed to collect a total of 14,040 units, the following month April it dropped to 9,633 units. In 2013 the same trend repeated itself as we collected 16,316 in March and in April it dropped by almost a half to 7,601. This trend clearly denotes that every time our catchment goes on recess we experience huge shortages as the demand is either constant or on the increase. This often puts us in extremely difficult situations thus exposing our beneficiaries who are the transfusing hospitals and the patients in perilous circumstance. To forestall a situation that will always put us in the same predicament, the Kenya National Blood Transfusion Service will hold the Easter Special Blood Drive in Nairobi and in all our Centres in the country between Saturday12th to Wednesday 23rd April 2014. In Nairobi where the national blood drive will be, a total of three blood donation teams will be deployed with about 25 donation beds at KENCOM in the City Centre. Similar activities will take place in our other regional centres in Nakuru, Eldoret, Kisumu, Mombasa and Embu and the satellite stations. In Mombasa our teams will be at G4S offices on 17th Hatua Likoni on 18th, Redeemed church on 20th, and Ukunda Mlaleo Health center on 22nd and 23rd. In Eldoret our team will be at the Recruits Training School-Moi Barracks between the 12th and 14th April. In Kisumu LIBLODA at RBTC Kisumu on 12th to 14th, town hall from 12th to 30th, Kenyatta sports ground, Central Square between 17th and 22nd April. In Embu our teams will be at ASK Showground, mwea grounds, Embu Kwiremia, Embu College, Runyenjes Matatu terminus between 14th and 24th April. The Nakuru Team will be at National Youth Service from 12th to 26th and Gilgil National Bank grounds from 14th to 25th. These regions and satellites have in the last couple of weeks been holding blood donation camps in a bid to augment our national blood reserves. On behalf of the Kenya National Blood Transfusion Service, I would like to call on all Kenyans of between ages 16 and 65 to come forward and donate blood. This is perhaps the greatest gift you can give your brother, sister, father, mother, friend or neighbor during this season when Christians are marking the death and resurrection of Jesus Christ. During this period we are targeting to collect about 20,000 units of blood. It is important to note that the demand for blood and blood products is on the increase owing to the increased incidents of road traffic injuries, terrorist attacks and maternal deliveries complications. We therefore calls upon all Kenyans to demonstrate a sense of patriotism and concern for fellow countrymen who may be in need of blood by standing up to be counted as voluntary-non-remunerated regular blood donors. In a bid to sustain blood supply in the country KNBTS will henceforth target the adult population and inculcate a culture of regular blood donation by among other strategies espousing the health benefits of donating blood to both the donor and the beneficiary. Blood donation has a two – way benefit, it saves lives of the sick who are transfused and on the other hand, it enables the donor to develop fresh blood and increases the production of bone marrow. It is also scientifically proven that blood donation helps reduce the risk of cancer. Other benefits to the donor is that the donor gets a free health check and know his or her blood group .They are also able to know their Transfusable Transmittable Infections (TTI) status including, HIV, Hepatitis B and C and syphilis since their blood is screened to ensure safety. The World Health Organization (WHO) benchmark for blood sufficiency requires atleast 1% of a country’s population to donate blood once in a year, in Kenya assuming that we have 40 million eligible donors we need approximately 400,000 units to achieve optimal sufficiency level, last year 2013 we managed to collect 160,000 units. There has been a recurrent question of where the blood that was collected during the Westgate attack period go. Before I answer that question I would like to give a brief background of the issues and the players who were involved. The Kenya National Blood Transfusion Service is a unit under the Ministry of Health charged with the mandate of collecting, testing, processing and distributing blood to all transfusing hospitals in Kenya. Last year the nation plunged into mourning following what came to me known as the Westgate terrorist attack where over 60 people lost their lives and scores were injured. As it were, the attack created unprecedented demand for blood following the numerous injuries. Many Kenyans turned out in their number after his Excellency the President, Uhuru Kenyatta made a national appeal to Kenyans to donate blood to help save lives of the injured. At this point I would like to thank all who came to donate blood for being selfless. I would however want to shed light on some aspects of the blood that was collected during the six days between Sunday 22nd and Friday 27th September 2013 when the shopping mall was under siege. The facts are as follows; the Kenya National Blood Transfusion Service collected a total of 17,230 units of blood with the bulk being donated at Uhuru Park in Nairobi with a collection of 6,175 units. The balance was collected in our 5 regional blood transfusion centres namely Kisumu (1,522), Embu (68), Mombasa (2,374), Eldoret (1,490) Nakuru (1,917). Other satellite stations like Kisii, Machakos, Nyeri, Kakamega, Garissa, Meru and Kitale also collected a substantial amount of blood. 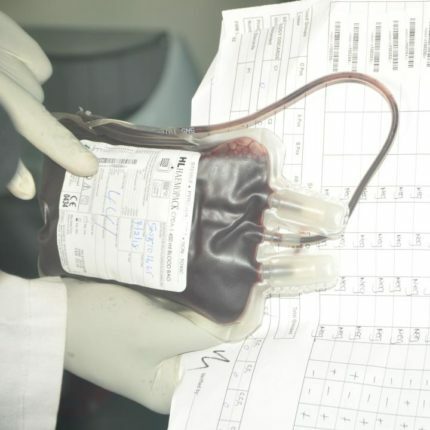 There has been talk on social and mainstream media that the Kenya National Blood Transfusion Service discarded the blood that was donated after it expired or went bad, nothing could be further from the truth. The life span of fresh blood is 35 days. The KNBTS distributed all the blood it collected to the transfusing hospitals across the country. The monthly blood requirement in Kenya is approximately 32,500 units that means the 17,230 we collected represented slightly more than a half of the national requirement. This means that our blood recruiters and mobiliser had work to do in the month. The blood was distributed all over the country to our centres who in turn distributed it to the transfusing hospitals. No blood was discarded as alleged by some quarters, the blood agency is managed by well trained and qualified personnel who could not have sat back as that precious commodity went bad. The components which were extracted from part of the blood including Platelets, Red blood cells and fresh frozen plasma(FFP) some have a lifespan of up to one year under refrigeration. It is imperative to note that the World Health Organization has set the benchmark for blood sufficiency in any country to be between 1 and 3% of its total the population. In Kenya working with a figure of 40 million people, if 1% of that population donated blood once a year we would have 400,000 units to meet our national requirement, or if half that number of people donated twice a year. We would therefore like to make a passionate appeal to Kenyans especially the adults to make it a habit to donate blood regularly. An adult male is can donate blood after every three months while a female could do it after four months. Donating blood improve the production of new blood cells by your bone marrow, reduces the risk of cancer and heart attack besides the noble act of saving another person’s life.